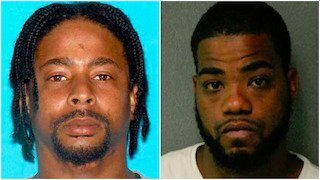 New Jersey State Police have charged five people in connection with a deadly "rolling shootout" on the Atlantic City Expressway that claimed the life of one man and injured four others. Police arrived on the scene Monday afternoon on the northbound side of the expressway near milepost 39 to find Rosemund Octavius, 22, of Egg Harbor Township, dead of a gunshot wound he sustained while riding in the passenger seat of a Nissan Maxima that police said was involved in the shooting. Later, four men who had sustained gunshot wounds parked a Ford Expedition riddled with 21 bullet holes at a Wawa on Delilah Road in Egg Harbor Township. They were then taken to the Atlantic City Medical Center. Witnesses also described a Dodge Ram truck involved the shooting. New Jersey State Police released photos Tuesday afternoon of a black Dodge Ram they believe may have been involved in Monday's shooting. The truck, which has a temporary Delaware license plate, was last seen traveling eastbound on the expressway and may have taken an exit toward Pleasantville, Atlantic County. 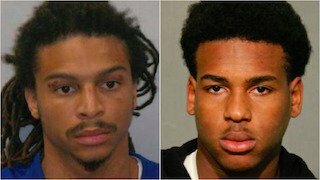 Authorities have charged Lenardo Caro, 24; Yahshaun Stukes-Williams, 19; Shaun Stukes, 38; Anthony Hicks, 24; and a 16-year-old boy, all from New Jersey, with weapons offenses after allegedly finding three handguns and an AK-style assault rifle in the Expedition. Though it's not clear yet who fired the shot that killed Octavius, police said they hope to identify the shooter quickly as they continue their investigation. The men in the Expedition are charged with unlawful possession of a weapon, second-degree possession of a weapon for unlawful purpose, third-degree possession of an assault weapon and second-degree possession of a defaced firearm. Three also have been charged with employing a juvenile in a crime. Anthony Hicks, 24, who was driving the Maxima, is charged with certain persons not to possess a firearm, unlawful possession of a weapon and possession of a weapon for unlawful purpose. All involved seemed to have known each other as well. An Egg Harbor Township judge set bail for each man at $250,000. Anyone with additional information about the shootings is asked to call New Jersey State Police at 609-882-2000.